Dubai: The public was warned to steer clear of a large whale shark spotted at Al Bahar beach at least until Friday when managers are expected to re-open the area to sunbathers. An advisory was issued by the Evironment Agency - Abu Dhabi (EAD), which tweeted images of the large marine creature quietly plumbing the shallow shores in the area. “If you come across a whale shark, we urge you to not approach it and for boat drivers to keep a safe distance. Let us know by calling 800555,” the agency tweeted. “EAD is monitoring a whale shark that has been spotted in Kasr Al Amwaj area in Abu Dhabi Considered Endangered on the IUCN Red List of threatened species, #WhaleSharks appear occasionally in the marinas and waterways of Abu Dhabi during this time of year and are not harmful.”. The sighting at Al Bahar beach of a large whale shark prompted the temporary closure of Al Bahar beach in Abu Dhabi until Friday as a precaution. But beach managers said they will reopen the sandy stretch of coastline on Friday to allow the harmless whale shark to find other Gulf waters to explore. On its Facebook page, Al Bahar advised the public to stay away following a public announcement by authorities to avoid the area until all is clear. 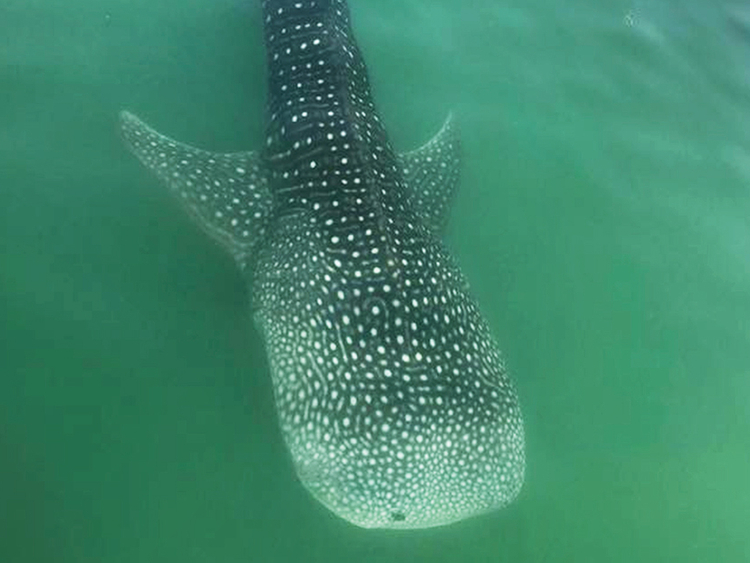 Sightings of whale sharks are a common occurrence along the UAE coastline which provides a calm refuge for the gentle creatures which pose no harm to humans. Whale sharks feed on small fish and tiny plankton and contrary to their name, are not a threat to human beachgoers as the name would suggest. In recent years, whale sharks have repeatedly made appearances in Dubai Marina attracting small crowds of residents. Whale sharks are listed as endangered by human activities and changes in ocean habitats around the world.